Kings Park Education provides hands-on, inquiry-based education programs for students from Kindergarten to Tertiary. Programs highlight the unique plants, people and places of Western Australia and the role we can all play in a sustainable future. All programs are delivered by qualified educators in line with the Western Australian Curriculum. Download the 2019 Kings Park Education program8.22 MB. Contact the Education Bookings Officer if you would like a copy posted to you or for any enquiries. Kings Park Education provides hands-on, inquiry-based education programs for Kindergarten to Tertiary students. Self-guided excursions are also available. Search for the program that best suits your needs. We want you to enjoy your excursion to Kings Park. Please plan your visit carefully to make sure everything runs smoothly. Bookings are essential for all school excursions to Kings Park and Botanic Garden. Whether you are here for a picnic, a play or an education program, please let us know you are coming. This will ensure your safety and enjoyment. We recommend making your booking at least one month in advance. Kings Park Education provides practical ideas for excursions and inspiration for teaching in the classroom. Professional development sessions can be customised to meet your school's specific needs. The Authority offers a variety of education activities for the community including tertiary opportunities, scholarships, traineeships, volunteer programs and interpretation through signage, art and publications. 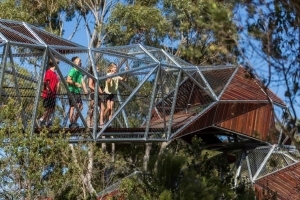 Rio Tinto Naturescape Kings Park is the perfect place for kids to connect with nature and have fun outdoors. Living classrooms provide leading-edge outdoor teaching spaces for students to learn.